Frank is a Board Certified Prosthetist and has worked as a Prosthetics and Orthotics technician for 13 years, with the past four years owning his own professional P&O technical company. He graduated with a Liberal Arts degree from Alderson-Broaddus College in Philippi, WV with focuses in Math, Science, and Theater. Frank has always loved to build things and to help people. 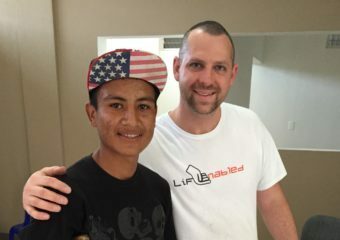 He was able to further develop these passions early in his life while on missions trips that included serving those in need by building houses. These basic carpentry skills fostered the passion that now drives him to excellence as a prosthetics and orthotics technician. Frank also serves as a sound technician at his church. His wife, Danielle, works for Nu Image Surgical and Dental Implant Center (a sponsor of LifEnabled). Danielle is a key contributor to planning and assisting in the Guatemala prosthetic clinics.